in the slicers end g-code to move the printer to maximum z position so the filament goes in a curve out of the coil into the extruder. Another issue is that the filament sticks inside the extruder. 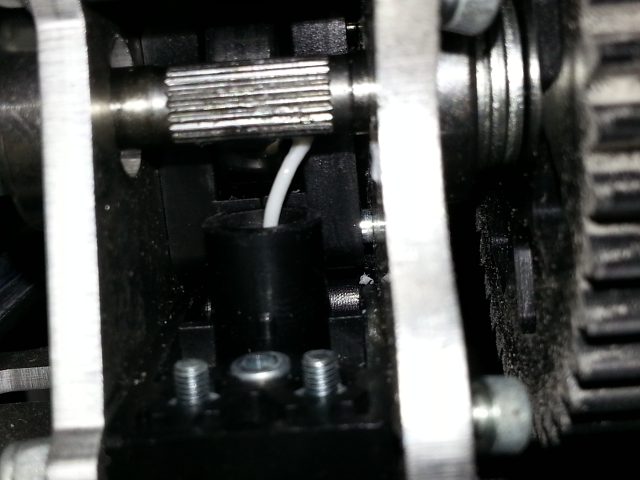 To fix that the motor (as in the picture) or the extruder can be removed. The photo shows, that there is no way of pressing the filament out. When the filament is hot and under pressure, then its diameter can become larger and when getting cold it can stuck hardly in the extruder. Take out the filament when not in use. To take it out preheat to PLA or ABS. When hot for a while, then turn the wheel counter clockwise so material comes out of the nozzle. 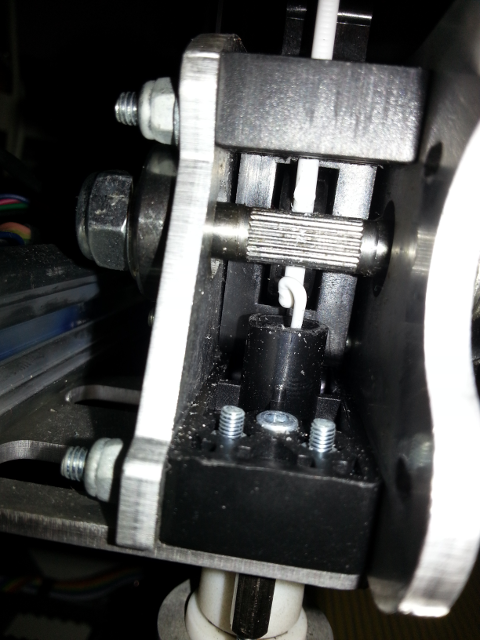 When it comes out smoothly, release the Butterfly bolt and pull the filament out without turning the wheel. If sticked filament occurs frequently then this could be a mis alignment between black and white plastic piece of the extruder that creates an edge where the filament sticks. With the white heat resistant piece untouched, drilling a bigger hole in the black piece removes this obstacle. When having the LCD controller then there is under the menu prepare the move axis command. The extruder motor is also considered as an axis and can be moved to extract or fill in the filament.